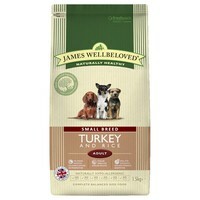 James Wellbeloved Adult Dog Small Breed Turkey and Rice is a complete food made from natural, wholesome ingredients designed for the smaller breed of dog. Easy to digest, the food is hypo-allergenic and contains no artificial colours, flavours or preservatives. James Wellbeloved Small Breed is perfect for dogs with skin and digestive sensitivities, and also contains cranberry and green tea extracts to help support natural defences. My little JRT is a very picky eater and on top of that he has allergies. I have tried a lot of different brands and it wasn't until I found James Wellbeloved that we finally ticked both boxes, something that works for him that he also loves to eat. It is a great product and I recommend it to everyone who has a dog with the same problem as I. My JRT has a little bit of this mixed in with his wet food. I need to be careful how much he has as he is prone to putting on weight. The small kibble makes it easier to measure accurately. I've used various flavours and sizes of Wellbeloved for all my dogs over the years. It's good quality and good value.